Also of note, and a continuation from Week 36: Republicans are turning on Trump — this week, not just in words this week, but in actions. And in response, by firing Priebus and replacing him with a general, Trump seems to be preparing for an aggressive approach towards the legislative branch. On Sunday, Trump’s communications director Anthony Scaramucci told State of the Union Trump is still not sure if Russia interfered in our election. This, just after CIA Director Pompeo, DNI Daniel Coats, and Joint Chiefs of Staff Chairman Joseph Dunford confirmed Russia meddled (Week 36). As Trump floated the idea of firing Robert Mueller, Former CIA director Brennan said elected officials need to “stand up” if this happens. After Trump said, “we’ll let Obamacare fail,” Trump has taken several steps to sabotage ACA, and make that a reality. Since taking office, Trump has spent nearly 1 in 3 days at a Trump property, and 1 in 5 days at a Trump golf property. CNBC reported investors have dumped the majority of ‘Trump trades.’ Investors are no longer confident tax reform, deregulation and fiscal stimulus will happen. Several people were arrested by ICE at the Houston INS office when they went for their marriage interviews for green cards. Pew Research found that 75% of Muslim Americans believe there is a lot of discrimination against Muslims in the US, and 74% believe Trump is unfriendly towards them. Thousands marched in Warsaw to protest their right-wing government’s attempted control of the Supreme Court and judiciary. Trump chose Poland en route to the G20 to deliver a nationalistic speech (Week 34). Trump floated the idea of Rudy Giuliani as a replacement for Sessions. WAPO reported replacing Sessions is viewed by some Trump associates as part of a possible strategy to fire Mueller. Trump continued attacking Sessions on Twitter Wednesday, questioning why he hadn’t fired acting FBI director McCabe. WAPO reported Trump spoke privately with confidants and advisers about the possibility of replacing Sessions with a recess appointment. Sen. Chuck Grassley responded tweeting the agenda for the Senate Judiciary Committee is set for the rest of 2017, and would not have time for an AG nomination. Democrats threatened to block recess appointments. Sessions told Fox News that Trump’s attacks are “kind of hurtful,” but that he intended to stay on and serve as long as Trump will let him. Yates cited as examples Trump’s efforts to bully Sessions into resigning, his goading Sessions to re-opening an investigation on a former political rival, and his efforts to get Comey to back off from Flynn then firing him. NYT reported David Apol, Trump’s choice to replace Shaub, has clashed with Office of Government Ethics employees over his efforts to roll back or loosen ethics requirements on federal employees, including those in the WH. The Center for Public Integrity reported Steve Bannon is potentially violating the Antideficiency Act, by using an outside shadow press office not employed by the Trump regime, and providing services for free. In another blow to the credibility of Trump’s Election Integrity Committee, a federal judge upheld a fine against Kobach, citing a “pattern” of “misleading the Court” in voter-ID cases. A lawyer in West Palm Beach filed a lawsuit with a federal judge in FL, saying Trump is violating the Constitution by making money from renting rooms in his hotels or other buildings to federal agencies. According to Gallup, Trump’s approval in underwater in 11 of the states he won in November, including NC (-11), MI (-10), WI (-9) and PA (-9). 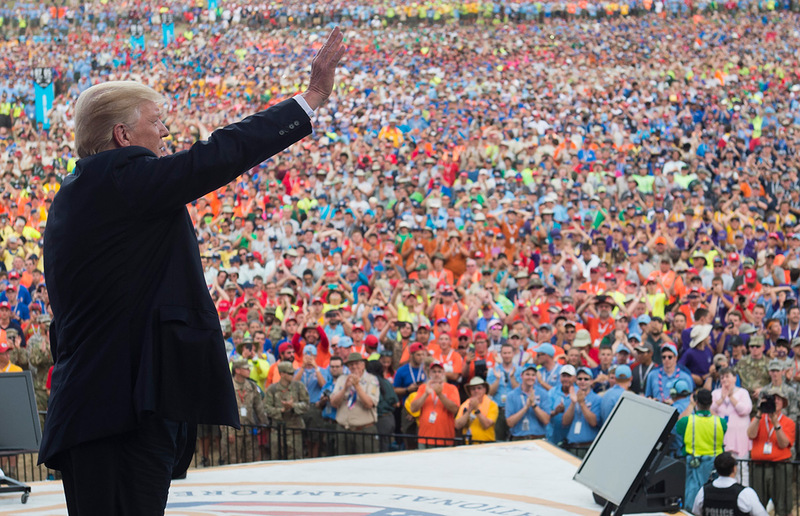 Trump’s Boy Scouts jamboree speech turned into a political rally, as Trump led the crowd to boo Hillary and Obama, chided the “fake news” and Washington “cesspool,” and promised to bring back Christmas. Randall Stephenson, the national president of the Boy Scouts of America is also CEO of AT&T, whose pending merger with Time Warner requires government approval. In Week 34, the Trump regime discussed using this pending merger as leverage over CNN’s reporting and president. The day after reporting on Stephenson’s role as CEO of AT&T, the Chief Scout Executive for the Boy Scouts of America issued an apology. After the State Dept’s Cyber Coordinator resigned (Week 36), Tillerson plans to shutter the State’s Office for the Coordination of Cyber Issues. The State Dept’s head of diplomatic security bureau, Bill Miller, resigned. Miller is one of a long list of senior State Dept officials who have resigned since Trump took office. CNN reported Tillerson is considering resigning, citing his frustration and doubt that “the tug-of-war” with the WH would subside. Tillerson is also upset about Trump’s unprofessional treatment of Sessions. Many of State Dept’s typical responsibilities have been re-assigned to the WH in a consolidation of power, including Kushner taking the Middle East, and in Week 36, the WH taking over Iran compliance certification. On Tuesday, Tillerson said he would taking time off. The State Dept refused to comment on whether he is happy. Longtime chief foreign affairs correspondent Andrea Mitchell criticized the lack of transparency from and access to Trump’s State Dept. Scaramucci threatened mass firings, saying he will purge aides who are not loyal to Trump or leak. His first firing happened Tuesday: assistant press secretary Michael Short, who is close to Priebus and Spicer. Trump’s nominee to lead the DOJ’s criminal division, Brian Benczkowski, disclosed to Congress that he previously represented Alfa Bank, one of Russia’s largest banks, whose owners have close ties to Putin. The FBI is investigating data transmission between Alfa Bank and the Trump Organization’s servers during the election, which may indicate back-channel communications. Benczkowski took on representing Alfa Bank after serving as part of Trump’s transition team. He continued despite reports of the FBI investigation (Week 21), and continued until his nomination in June. A complaint filed by the Treasury’s Office of Foreign Asset Control alleges Trump ally Rohrbacher violated the Magnitsky Act by trying to get Russia’s deputy general prosecutor removed from the US sanctions list. Ahead of his Monday, closed-door testimony to the Senate Intelligence Committee, Kushner publicly released the full text of his testimony in which he denied participating in, or knowledge about, collusion with Russia. After his Senate testimony, the WH set up a podium with the White House seal for Kushner to make his statement to the media. Kushner claimed he met with four Russians but did not discuss specific policies, including US sanctions against Russia. Kushner also said, “I have not relied on Russian funds for my businesses.” ‘Relied’ seemed a carefully chosen term for its possibility to obfuscate. Guardian reported Kushner bought part of the old New York Times building from a Russian oligarch, Lev Leviev, known as the “king of diamonds,” for $295 million in 2015. Kushner’s recently disclosed $285 million loan from Deutsche Bank was used to refinance this deal. The purchase is part of Mueller’s investigation of Trump-Russia ties. Leviev also sold properties to Prevezon, the Russian company represented by Veselnitskaya: apartments at 20 Pine Street in NYC. The property was subject to a money laundering case. The Prevezon money laundering case, originally brought by Bharara for $230 million before he was fired, was settled by Sessions two days before trial for $6 million. The 20 Pine Street apartments were also released. Mother Jones reported on Monday, former senator Carl Levin sent a letter to Mueller about his 2000 investigation of Kaveladze, who he described as a “poster child” for Russian money laundering. Levin said Kaveladze circulated more than $1.4 billion through US bank accounts. Kaveladze was Aras Agalarov’s representative at Donald Jr.’s June 9 Trump Tower meeting. Ivanka hired a defense lawyer to represent her in the Russia investigation. Donald Jr. hired an additional lawyer with congressional experience to his legal team. On Tuesday, Manafort testified in front of the Senate Intel Committee on the June 9 meeting at Trump Tower. Tuesday, he was also subpoenaed by the Senate Judiciary Comm to appear. On Tuesday, Kushner testified behind closed doors for the House Intel Committee . Democratic leader Adam Schiff said Kushner had agreed to come back. On Thursday, Bill Browder, founder and CEO of Hermitage Capital Management which was looted by Russian kleptocrats in a case that gave rise to the Magnitsky Act, testified in front of the Senate Judiciary Committee. Browder testified he believed there was more than one meeting between Veselnitskaya and Donald Jr., Kushner, and Manafort, and that Veselnitskaya’s goal would be to repeal the Magnitsky Act. Browder also testified that Russian intelligence knew about the June 9 meeting in advance, and that he believes Fusion GPS — the firm behind the Russian dossier to get dirt on Trump — was hired by the Russians. On Tuesday, by a vote of 419-3, the House passed a Russian sanctions bill, punishing Russia for election interference, and curbing Trump’s power to roll back sanctions. Weekly Standard reported their interview with Vladimir Kara-Mirza, a Russian journalist, politician and filmmaker, started late because he was in the hospital being treated for poison, again. Buzzfeed filed a lawsuit to compel the release of information on the death of Putin’s former media czar, Mikhail Lesin, who was brutally murdered in DC the night before a planned meeting with DOJ in November 2015. The Senate passed a motion to proceed on healthcare Tuesday with no input, no debate, no CBO score, and without knowing what they would be voting on once the motion passed. 13% support Obamacare repeal. Trump’s s actions have galvanized many who care about health care, climate change and research funding to run for office. A PAC called “314 ACT” (named for pi) was set up to recruit and assist scientists to run. At a rally in Ohio Tuesday, Trump said he could act more presidential than any other president except, “the late, great Abraham Lincoln.” He also joked he should be on Mount Rushmore. Trump also told a graphic tale about illegal immigrants slicing up beautiful teenage girls with knives, “They don’t want to use guns because it’s too fast and it’s not painful enough.” The story is a lie. WAPO reported between the Ohio and Boy Scout rally, Trump made 29 false or misleading statements. The Pentagon was not informed of Trump’s announcement ahead of time, and was left scrambling with no plan in place for implementation, including how to deal with transgender individuals now serving. The House and Senate Armed Services Committees were also not notified. The committees were awaiting results from a 6 month review of potential impact ordered by Mattis in Week 33. On Thursday, the chair of the Joint Chiefs of Staff instructed the military policy on who is allowed to serve would not change until the WH sends DoD new rules and the secretary of defense issues new guidelines. Secretary Mattis was on vacation when Trump tweeted. According to the NYT, he was given only one day’s notice about the decision, and per people close to him, was appalled that Trump used Twitter for the announcement. Trump’s candidate for a senior position at the DHS, John Fluharty, withdrew from consideration because of Trump’s transgender ban. Wednesday, Trump chastised Sen. Lisa Murkowski tweeting she had let the Republicans and country down by not voting to repeal Obamacare. Later that afternoon, Interior Secretary Ryan Zinke called both of Alaska’s senators, saying Murkowski’s vote would impact the Trump administration’s view on issues that are a priority for Alaska. Of note, all during the week, Republican men insulted and threatened their female colleagues for not supporting their healthcare bills. Male senators not in support did not face the same harassment. Sen. Lindsey Graham said Thursday, “there will be holy hell to pay” if Trump fires Sessions, and said if Trump fires Mueller without good reason, it would be “the beginning of the end” of Trump’s presidency. Later that day, Graham and Booker said they will introduce a bipartisan bill next week that will limit Trump’s ability to fire Mueller. On Wednesday night, Scaramucci accused Priebus of leaking his financial disclosure information, and said he would be contacting the FBI. Shortly after Politico indicated the information is public, he deleted the tweet. On Thursday, the Senate passed a new sanction bill by a 98-2 vote, which would sharply limit Trump’s ability to suspend or lift sanctions on Russia. With House and Senate passage, the bill now goes to Trump. On Friday, Russia retaliated, expelling a large number of US diplomats and seizing US diplomatic properties. Late Friday, the WH announced Trump plans to sign the bill. Trump encouraged officers to be rough with suspects in a speech to police Friday on Long Island, addressing the gang MS-13. After all other versions of Senate health care bills failed, late Friday, the Senate voted on the “Skinny Repeal.” An 8-page copy of the bill was provided to Democrats at 10 pm Friday night, ahead of a midnight vote. The night prior, GOP senators Johnson, Graham and Cassidy announced they would only vote for the “Skinny Repeal” if House Republicans assured them that it would never become law. Still the vote proceeded. At 1:30 am Friday morning, after over an hour spent by Pence and other Republicans to change Sen. McCain’s mind, the Skinny Repeal bill was voted down 49–51: Collins, Murkowski and McCain voted with Democrats. Trump also again pushed for the Republicans to end the legislative filibuster, a long-time norm in the Senate, so bills can pass with 51 votes. Trump unceremoniously fired Priebus, informing press and staff shortly after Air Force One landed in DC. WSJ reported that part of Trump’s rationale was that Priebus did not fire back at Scaramucci. Priebus served the shortest time of any chief of staff in a president’s first term since WWII. WAPO tracked the Trump regime’s unusually long list of firings, resignations, and withdrawals from consideration. Trump also has far less appointed and confirmed candidates for key executive roles. Trump appointed General John Kelly, current Secretary of DHS, to the role of chief of staff. Kelly little political and legislative experience. One Ryan-Priebus ally said the next phase of Trump presidency will be warfare against GOP Congress. Trump waves after a highly politicized speech to the Boy Scouts during the National Boy Scout Jamboree.